Rafael Quirico knew something big was happening, he just had to keep it going. What was happening was a no-hitter in the single-A South Atlantic League in July 1991 and Quirico finished it off. "I didn't start to think about one until the seventh," Quirico told The Associated Press afterward. "I was nervous going into the ninth." Quirico later got another start, one with much higher stakes - his major league debut. That outing, though, didn't go as planned. It also ended up being his only major league outing. Quirico's career began in 1987 signed by the Yankees as an amateur free agent out of his native Dominican Republic. He played his first season in 1989, spending it in the rookie Gulf Coast League. In 17 outings, he had a 3.82 ERA. He moved to single-A Greensboro and short-season Oneonta for 1990, then returned to Greensboro in 1991. He went 12-8, with a 2.26 ERA in 1991. Quirico played his 1992 season largely at high-A Prince William. He then made AA Albany-Colonie in 1993 and got a look at AAA Columbus. In June 1993, Quirico pitched well in a no-decision for Albany-Colonie. "He set up his pitches real well," Albany-Colonie manager Mike Hart told The Schenectady Daily Gazette after that game. "He stayed ahead of the hitters. He got his changeup over. He wasn't breaking ball conscious all the time." Quirico played at Columbus full time in 1994 and 1995. He then moved to the Phillies system as a free agent in 1996. He also made the majors. Quirico got his call up in June 1996 and it came with a start against the Reds in Cincinnati. Quirico didn't make it out of the second inning. He gave up four hits, walked five and gave up seven earned runs. "I don't know if I was nervous or what," Quirico told The Philadelphia Inquirer afterward. "I was trying to throw strikes, but the ball was riding out." 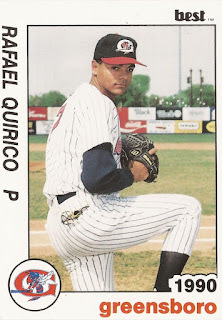 Quirico played the rest of that year in the minors, then 1997 in the minors for the Angels, ending his career.